Editors Thomas, Cummings, and O’Donohue took on a difficult task when they set out to convince Cummings to tell the story behind the story of how and why he created the various organizations selected here. Of course, he balked at the idea of “showing off” these successes, but the editors were finally able to persuade him of the potential benefit to readers. 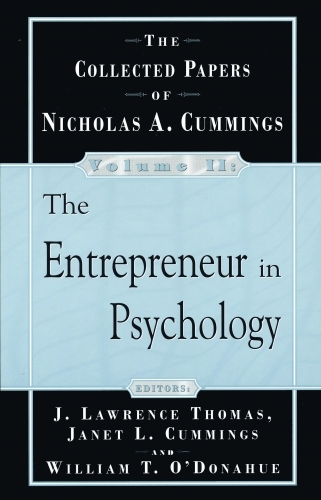 First, there is the revelation of psychologist as entrepreneur and the delicate balance that is required in order to proceed in this direction with integrity and effectiveness. More important, these organizations were for the most part conceived of as being in service to the profession or to its legislators rather than being focused on profits. Their success, therefore, has had more than a little to do with strengthening the ability of the field to move forward even as it is pulled in different directions.